Our Clients Can Avail From Us Premium Range Of Vial Inspection Machine That Is Fabricated From Premium Quality Steel And Find Application Across Industry Verticals. We Offer The Range In Most Reasonable Rates. In Addition, We Offer Customized Specifications To Meet The Specific Requirements Of The Clients. With The Sheer Dedication And Experienced Of Our Well Known Experts, We Are Able To Bring Forth Extensively Acclaimed Automatic Ampoule Inspection Machine. It Is Offered By Us At Comprehensive Prices In Order To Suit The Varied Needs Of The Clients. Hence, We Are Widely Admired As A Noted Manufacturer, Exporter And Supplier Automatic Ampoule Inspection Machine. Due To Its Resistance Towards Corrosion, High Tensile Strength And Hassle-free Operations This Is Hugely Applauded. This Machine Is User-friendly And Used For Inspecting Ampoules In Food Processing And Pharmaceutical Industries. 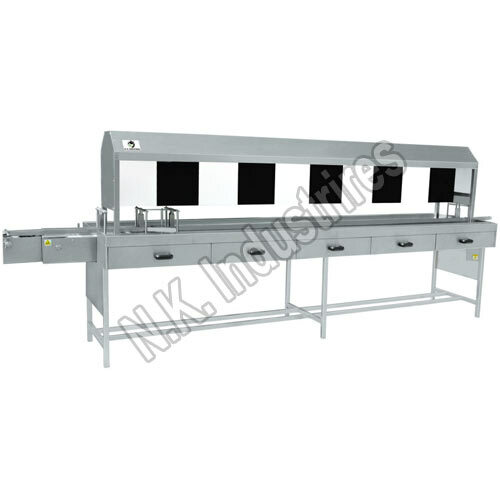 NKVI-250 Is An Automatic Visual Vial Inspection Machine. This Machine Is Used For Inspecting Vials After Sealing Has Performed. Inspection Is Required To Check Problems With Fillings, Breakages Or Any Other Problems. The Whole Machine Is Constructed With SS Material And Machine Structure Is Also Made With SS.